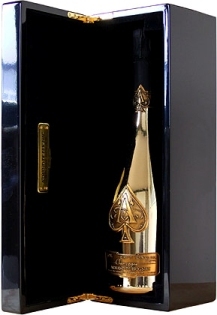 Time to look forward to what to drink to bring in the New Year. There are so many choices to celebrate with, from nexpensive sparklers from Australia, Spanish Cava, Italian Prosecco, sparklers from France and then the ultimate with French Champagne. Champagne is in great demand these days: availability is low and the dwindling supply is quickly snapped up by enthusiasts around the world; the soaring price increases do not deter buyers who want the ultimate in celebratory wine. deVine has searched high and low to bring these products for your consideration and listed below are some of our favourites. deVine’s offers all of your Christmas gifting needs. Pictured is a gift basket of wine. 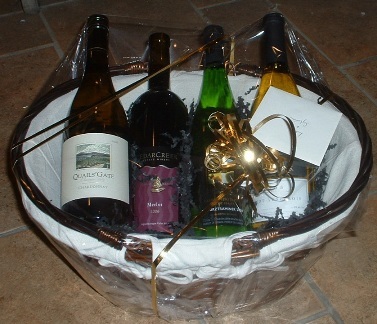 You can customize your basket by adding stemware or other sundry items. Many styles of baskets available and the wine possibilities are endless. Do give us some lead time to wrap. 1) the Twelve Days of Christmas Beer Sampler – $91.17 with a focus on seasonal holiday season releasesl . Only 40 cases available so grab yours while supply lasts. Some of the beers in this package is already out of stock at the government warehouse. 2) the December’s Mixed Case – $208.84 is an eclectic mix for everyday drinking with several wines suitable for the traditional Christmas turkey dinner. 3) the Wine Spectator magazine issues their Top 100 wines every year around this time. This year, we’re offering a mixed case of nine wines that made the grade in 2012, plus one from 2011 and two wines from 2010 to complete the mixed case. The Wine Spectator Top 100 Mix Case – $299.39 would serve as wonderful Christmas presents, have your own Spectator tasting or enjoy these highly regarded wines for yourself at your leisure. We have also just received many nic nacs that would be great as stocking stuffers, new Riedel and Schott Zwiesel stemware and much more, drop by the store to visit if we can be of any assistance.